me and him: scented waste. there is only one thing i hate worse than a stinky, full garbage. a stinky, full garbage in a scented garbage bag. it gives the rotted waste some sort of sweet/fake fresh flavor. take a whiff and die. it's a cryin shame we bought an extra value box. anyone in the need of a few garbage bags? we have plenty to spare. Lol! 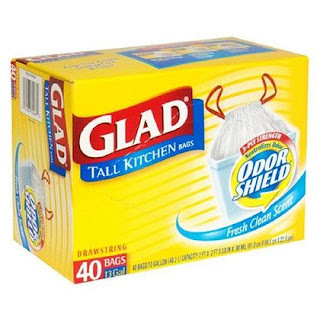 I've never smelled the scented garbage bags, but that is how I feel about most air fresheners! I'd take the stink any day! haha. note to self: never buy geri scented garbage bags as a gift and never mention to jason that geri dislikes the garbage bags so much she even blogged about them! Some air fresheners don't work well in the bathroom, either. Some smells just don't mix well, if you know what I mean. I completely agree. I hate sented garbage bags! "scented" "garbage" isn't that an oxymoron? I agree - I hate the smell . . . of garbage . . . and the scented bags. Pee Uwww!!!! YIKES! I have never had them or smelt them BUT I bet I would hate them too. I can't handle the smell of garlic every since I had a roomate that bathed in it and ate an obscene amount of garlic... Garlic+Vanilla=GAG!